I received my Moby wrap from one of my bff’s, Rachel, for a shower gift. I had registered for it with my cloth diapers on kellyscloset.com with doing pretty minimal research on the product. Seeing a few people using these (and by a few I really mean like one or two) I was always intrigued and liked the idea of these better than a typical carrier. There are other options for positions to accommodate whatever your baby prefers. They even have one that is meant for breastfeeding. I have yet to try this one out, simply because I am not comfortable breastfeeding in public.. who knows if I’ll ever get over this, but that’s a whole other story! Overall, I really like my moby. It’s versatile, and I could carry Breckin all day long in it. The fabric evenly distributes his weight so carrying him doesn’t seem so strenuous. The best thing about it is that I can go into a store and not have to lug that ridiculously heavy and awkward car seat around, or try to maneuver a stroller through narrow isles. Plus, you can do stuff around the house with your baby and have both arms free! For instance.. today I wrapped Breckin up and went outside to rake the leaves. I would never be able to do this just holding him, and to set him in a bouncy seat outside really isn’t ideal, so being able to carry him in the wrap is a perfect solution. I’ve done other yard work carry him in this wrap too, but it is a little weird to bend over with him, but this could be better when his neck muscles are a little stronger. I would say the only downsides to the wrap is that I find it very difficult to wrap in public. The wrap is really long and drags on the ground when you wrap it around yourself. If you were to try to do this in a parking lot you’d probably get the wrap dirty and it’d just get kind of annoying. My solution – I put it on before I leave the house. Although I probably look VERY silly driving around with my wrap on me, it’s soo much easier to just get out of the car, put Breckin in the wrap and go. I have not tried any other baby carriers (such as Ergo Baby or Baby Bjorn) so I don’t have a lot to compare to. 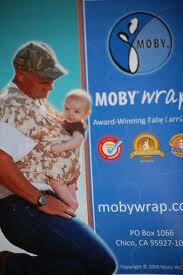 But I am perfectly satisfied with the Moby wrap where I don’t feel like I want to try anything else. So thank you Rach for giving me my Moby! I will continue to get a lot of use out of it!